The last known survivor of the Nazi holocaust of homosexuals is to be awarded France's top honour, Ordre national de la Légion d'honneur (National Order of the Legion of Honour), on the recommendation of French President Nicholas Sarkozy. 97 year old Rudolf Brazda spent nearly three years at the Buchenwald concentration camp. His prisoner uniform was branded with the distinctive pink triangle. The award was announced 66 years to the day that he finally left Buchenwald. Philippe Couillet, president of Les Oublié(e)s de la Mémoire (the association which campaigns for recognition of the suffering of so-called 'pink triangles'), said Brazda's award "marks a further step in the recognition of the deportation of homosexuals" and rewards his bravery in speaking publicly about his experience. Brazda's life has been documented in a new book 'Das Glück kam immer zu mir' ("Happiness always came to me," which is sort of his motto as he believes he survived through unbroken humor and optimism). Author Alexander Zinn. filmed his research and interviews, as well as Brazda's shattering return to Buchenwald, for a new documentary, which he hopes should come out this year. 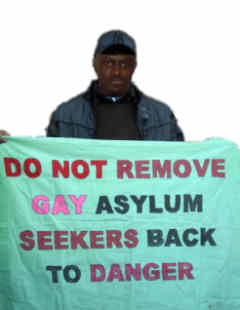 In spite of his old age, and health permitting, Brazda is determined to continue speaking out about his past, in the hope that younger generations remain vigilant in the face of present day behaviour and thoughts similar to those which led to the persecutions endured by homosexuals during the Nazi era. Brazda will receive his award Thursday 28 April during a speech to students at College Puteaux (in Hauts-de-Seine). It will be presented to him by Marie-José of Chombart Lauwe, a former resistance fighter who was deported to the Ravensbrück work camp and who is now president of la Fondation pour la mémoire de la déportation (the Foundation for the memory of the deportation).